The name of the domain relates to the18th century property owner, François Xavier de Lambert, bishop of Saint-Paul-Trois-Châteaux. The domain with its own winery was only establised by André Gras in 1969 with 1970 being the first bottled vintage under the St Francois Xavier label. His two sons Jean François and Christian Gras took over responsibility of the vineyards and winery in 2005 and become the 4th generation Gras owners. The Gigondas vineyards comprise only 13 hectares. We were enormously impressed with the wines truly expressing their individual terroirs. The Gigondas Rouge has won two gold medals in the local Rhone Valley shows. Sensational, cherry, strawberry fruit supported by smooth tannins after a long maceration. 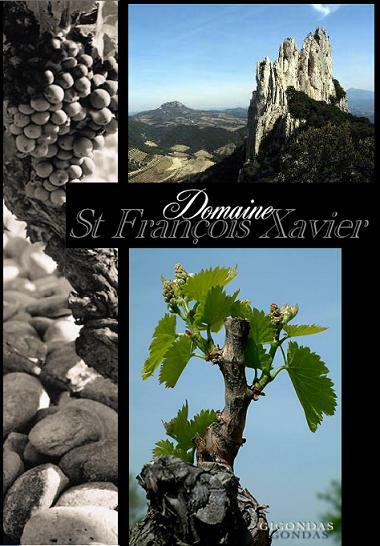 The Prestige des Dentelles is made from their prized vineyards at the foothills of the Dentelles range. It is a blend of 70% Grenache, 13% Syrah, 12% Mourvèdre and 5% Cinsault. The vinification is traditional with a long maceration of 25 days. Aged in old barrels for 8 to 12 months has given the wine extra character and structure.